First test observation has been made between KVN Yonsei station in Seoul and VERA Mizusawa station on 1st Nov. 2008, and fringes have been successfully detected at 22 GHz. 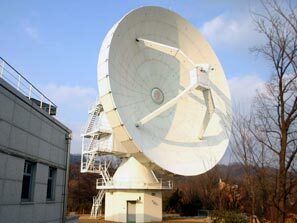 KVN (Korean VLBI Network) is a new VLBI array that consists of three 21m-telescopes located in South Korea, and now KVN people have been working on the system evaluations to start its regular operation from 2009. The success in the first test observation confirms good performance of KVN system as VLBI stations, and thus is an important milestone for the VLBI observations of KVN. In near future KVN and VERA will conduct joint observations as core stations of East Asian VLBI Array (EAVN), and hence this first experiment done between KVN and VERA is certainly the first step toward the realization of EAVN.